July 25th, 2017 | Moving Tips. If you are scheduled to move during a heat wave, you might be considering putting off the experience until the temperatures cool. 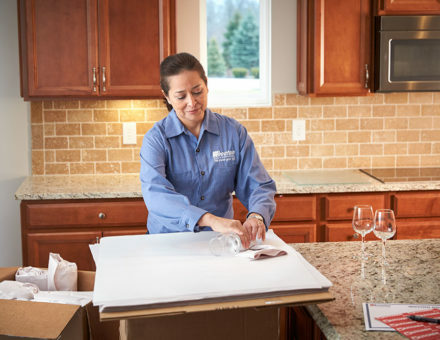 However, before you assume that moving in the heat will be a completely miserable experience, there are several things you can do to keep yourself from overheating and your items from becoming damaged. Don’t let the summer heat ruin the excitement of your move. Instead, here are a few ways for you to keep your cool and beat the heat while you relocate. One of the most time consuming and exhausting aspects of moving is packing. If you’re lucky enough to have central air conditioning, packing up your belongings will be a breeze. However, if you don’t, and you’re expecting a heat wave, the process of getting all your belongings into boxes can be miserable. Don’t take on this chore. Instead, leave packing to the professionals. In addition to saving yourself from an uncomfortable, sweaty experience, a professional packing team will have the expertise to secure all your belongings with the correct materials. Your stuff will be safe, and you’ll avoid having to sweat while you hurry through the process. Protecting your plants and pets while you move during the summer heat is critical. Your dogs and cats should be isolated inside of your home in a back room that is cool, especially when you are moving the boxes out of your home. Make sure your pets have plenty of fresh, cool water, and when you’re ready to move them, place your pets inside a carrier and into your air-conditioned vehicle. When it comes to your plants, it is best to either give them to a friend or neighbor or leave them for the new tenant or homeowner. However, if you cannot part with your plants, it’s important to protect them from the heat and the stress of the move. Begin by transferring all your plants into inexpensive plastic pots. This should be done a few weeks before the move to allow your plants to adjust. Next, provide your plants with a healthy drink of cool water before immediately putting them into an air-conditioned vehicle. Never place your plants into the back of a moving van or truck. The temperatures will be too high, and the plants will not be secured. Moving day has finally arrived, and the temperatures are expected to skyrocket. It is best to begin the process of moving your boxes as early in the morning as possible. Begin with the heavy boxes, and leave the lighter boxes for the afternoon when it is hotter outside. If the temperatures are extremely high, do not risk your health, and instead, take a few days to move. Avoid leaving your boxes out in the heat for too long. It only takes a few moments in the direct sunlight for your fragile belongings to melt or become damaged. Instead, load all your boxes immediately. Your laptop, flat screen television, and video game consoles can melt or become severely damaged if exposed to the heat for an extended amount of time. Instead, transport these items in your air-conditioned vehicle. Avoid accidentally tossing any perishable food, including pet food, into a box. The item could spoil in the intense heat, and create an unpleasant mess. Your photos and albums will melt if they are left in the heat. Once again, photos are best transported in an air-conditioned vehicle. If you are the proud owner of a wine collection, the bottles should never be transported in the back of a hot moving van. When wine is exposed to extreme temperatures for an extended period of time, it can drastically change wine’s taste, and the heat could damage the cork, which will result in a huge mess. It is critical to keep both yourself, your family, any friends and the movers safe during the entire moving process. To begin, always dress appropriately for the weather. Wear loose-fitting, breathable clothing and plenty of suntan lotion. Take several breaks from lifting boxes, and stay well-hydrated. Additionally, make sure the movers are safe from the heat. Offer them a cold drink and a cool place to relax for a few minutes every hour. Moving can be an exhausting experience, especially during a heat wave. If you are planning to move, no matter what the season, don’t hesitate to contact the professionals at Wheaton World Wide Moving.